This morning someone sent me an email asking how I had created the search on my alternatives to YouTube page. The answer is that I used Google's custom search engine tool to specify pages that I wanted indexed in my search engine. In the video embedded below I demonstrate how to create a search engine. Slides of the process are embedded below. 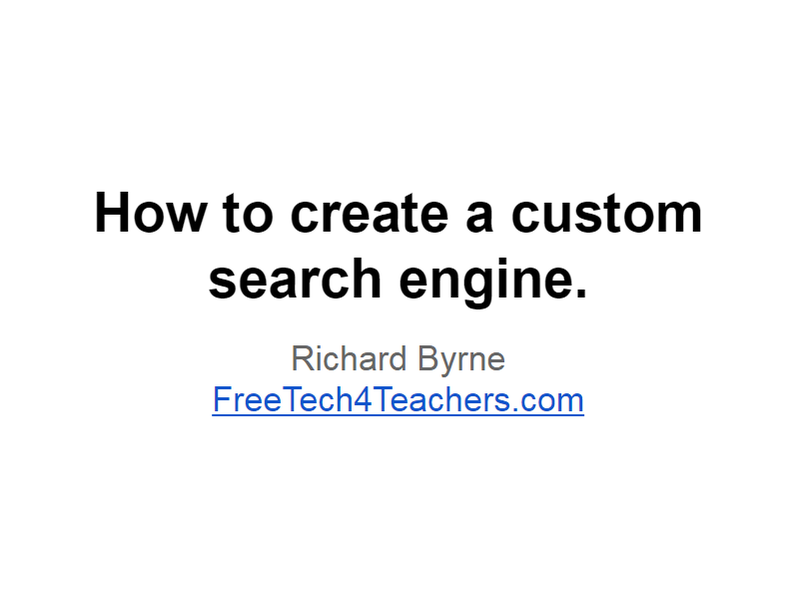 Creating your own search engine can be a good way to help students limit the scope of their searches. For example, when you're teaching younger students about search strategies you might want to have them use a search engine that only indexes a few dozen websites so that you can have some assurance that they won't be landing on pages of questionable content. Last week I had a university professor tell me that he planned to use a custom search engine so that his students could search an index of readings that he had bookmarked over the years.